Innovative, fresh, fun - this glorious module is superb! This is #7 of my Top Ten of 2014! This module clocks in at 48 pages, 1 page front cover, 1 page editorial, 1 page ToC, 2 pages SRD, 1 page back cover, leaving us with 42 pages of content, so let’s take a look! All right, still here? This module kicks off in a small town in the Klavekian kingdom and for once, the PCs attend festivities that are NOT crashed by some threat or another – instead, the PCs actually get to party! Whether they party conservatively or like there’s no tomorrow – first, minor consequences of the things to come already announce themselves during the information gathering and, on the next day, hangover may have settled in both literally and metaphorically: A shipment of goods to an isolated enclave of the Klavek kingdom was lost to sea monsters and thus, the two most prominent merchants try to hire the PCs to deliver a shipment of necessary goods on the land way. Thankfully, the module does tackle this concept in a rather unique manner: The other merchant hires a rival adventuring group and from here on out, decisions, consequences and speed are key: Via a handy flow-chart for the DM and a speed point mechanic as well as decisions galore, the players may opt to choose their own pace and face the consequences of their decisions – beginning with the very starting contracts legalese potentially cheating them of their hard-earned rewards if they are not on their toes! Instead of utilizing the somewhat flawed caravan-rules, the module instead opts for a different route – the decisions made award and penalize their consequences with speed points, which can be used to determine how they fare. Unlike 4 Dollar Dungeon’s superb “Journey to Cathreay“, the focus here is thus less on a journey and more on an overland race against rivals. And the decisions, like in all good chases, have consequences – sabotaging a ferry, for example, may incur the ferryman’s wrath upon the trip home, to save or not to save a halfling druid in distress may also change the course slightly…and did your players pack detailed maps? Otherwise navigating the passes might be more challenging than just facing down the lethal cyclops in wait. It should be noted here that the combat encounters sport AaW Games traditionally superb maps! Beyond rivals (and potential for using free web-enhancements), the journey also requires that the PCs navigate a landslide by crossing through a salt mine, where the very air might dehydrate the PCs and beyond dangerous boars and the like, the PCs have to salvage goods from teh grounded vessel ina rather nice mini-game. Upon finally arriving in Cherr’s Landing, things become interesting – the speed point tally is revealed to the PCs and they may spend them to accomplish specific tasks; unspent speed points total into the final success conditions and yes, a second flow-chart makes running this section of the module just as easy as the one before. In the city, once again, decisions abound – which caravan to employ, for return goods, for example – mules? Light horses? Quite a few choices to be made, all with consequences. Better yet, the partying in the beginning? Well, PCs have to sell goods and acquire new goods and return to their home – preferably before their competition does! 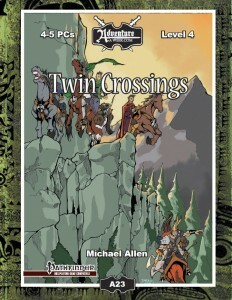 Beyond dangerous individuals trying to sabotage them and the dangers of the road…well, have I mentioned that the PCs may trail-blaze through a very mountain with magical tunnel bores, provided they found them? The module also provides e.g. the salt worms as fully depicted monsters, 5 player-friendly maps of combat-relevant encounters (in AAW Games’ superb quality), a couple of cool magic items and 2 pages of chase cards to facilitate the running of the chase in the beginning of the module. Editing and formatting are top-notch, I didn’t notice any significant glitches. Layout adheres to a drop-dead gorgeous two-column full-color standard and the pdf comes fully bookmarked for your convenience. The original color artwork is neat and the cartography stellar. Michael Allen delivers one of the best modules I’ve read all year here. Among so many modules focusing on killing y, exploring ruin x, etc., this module is a HUGE breath of fresh air; It’s focus on time and consequences as opposed to “Kill ’em all” is more than refreshing – it is inspired. I am not engaging in hyperbole when I’m saying that this module is INNOVATIVE. It utilizes chases, combat and commerce in a way that elicits more excitement than one would assume from such a module; Indeed, while the rivals make for a neat opposition, it is neither them, nor the journey that are the focus of attention here: Instead, this module breathes the spirit of Jules Vernes in its fast pace, its consequences and the emphasis on creating a believable world. This module is beyond just a fresh breeze – it is a storm. Yes, it is a humble module; yes, it does not center on a BBEG trying to destroy the world – and it is infinitely better off for it. If you were rather bored by the bureaucracy of Jade Regent’s caravan rules, I implore you to get this. I had the utmost joy running this module, so did my players, and its distinct focus, its concise mechanics, the ease with which one can run it due to the immensely helpful flowcharts – all of these conspire to make this one a true gem in my book. My final verdict will clock in at 5 stars + seal of approval and nominating this as a candidate for my Top Ten of 2014. Even among the best AAW modules, this one stands out and shines and represents all the virtues of the company. You can get this glorious module here on OBS!